Does there need to be a reason for dining out? Well, not really. However, when it is a special occasion, which calls for more premium eats, I guess that would be an excuse to go. This was the case when Snake mentioned that we should all go out to eat since his, mine, Chill and Costanza's birthdays fall within a month of each other. At first, Costanza suspected it was another one of my lame excuses to gather a bunch of people for the purposes of visiting a new restaurant. Partly true I suppose, but it really was Snake's idea. Now as for the choice of restaurants... Of course it was mostly my influence. 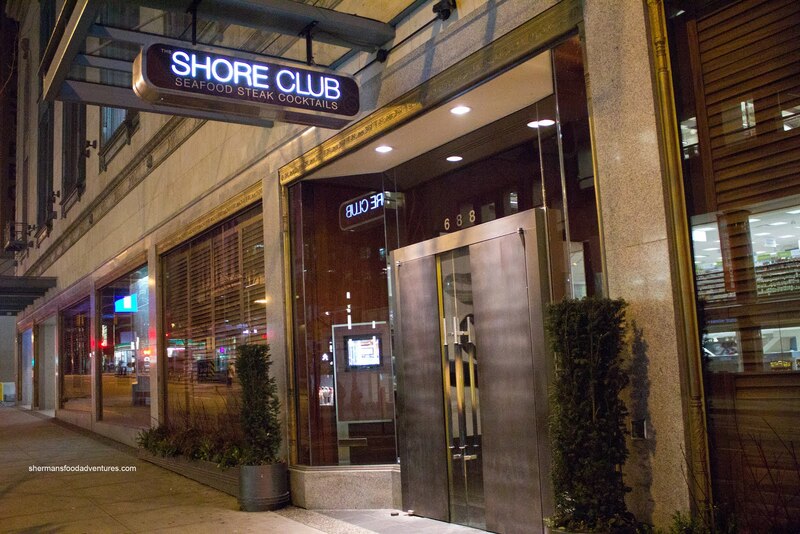 I had suggested the Shore Club (part of David Aisenstat's restaurant group) because it seemed to fit the theme of the dinner. 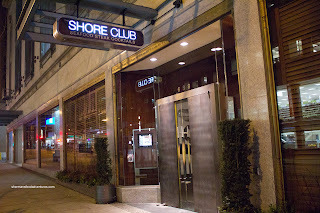 4 guys celebrating each others' birthdays at a swank place which boasts a variety of food. As for the food, we shared 4 appies to start. 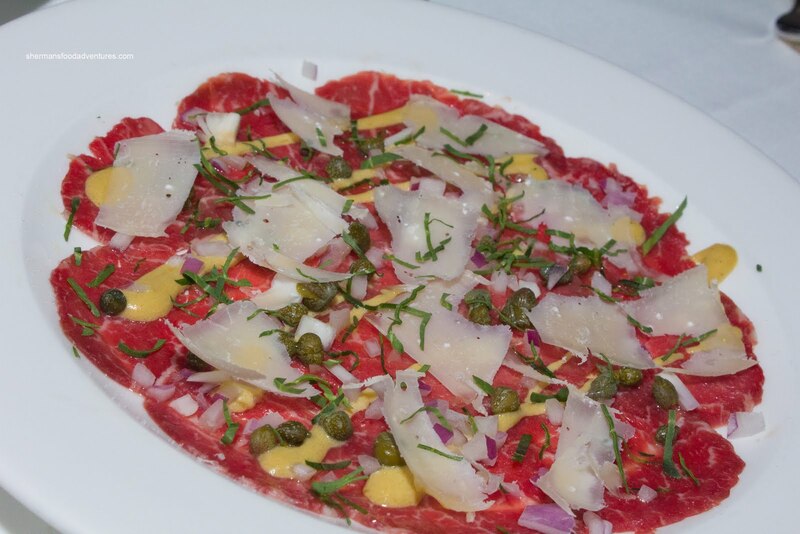 The Beef Tenderloin Carpaccio was nicely presented with diced red onions, capers, shaved Parmesan, dijon peppercorn drizzle and truffle oil. The beef tenderloin itself was thin and buttery soft. Some good flavours at work on the plate except the red onions. I could see where they were going with this due to the nice crunch, however, I felt the red onion was overpowering. If they didn't add that, the carpaccio would've been better. At first, when Costanza suggested we get the Steamed Mussels Meuniere, I was indifferent. 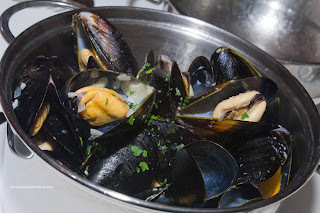 As much as I love mussels, they can be pretty generic and uninspired at times. Not this one though. It arrived in a large pot and was served hot. One sip of the broth and "Bam", the flavours smacked us in the face. Sure, it was on the saltier side, but we didn't mind because it was garlicky and buttery. And for once, the mussels were plump and humongous. Very satisfying. 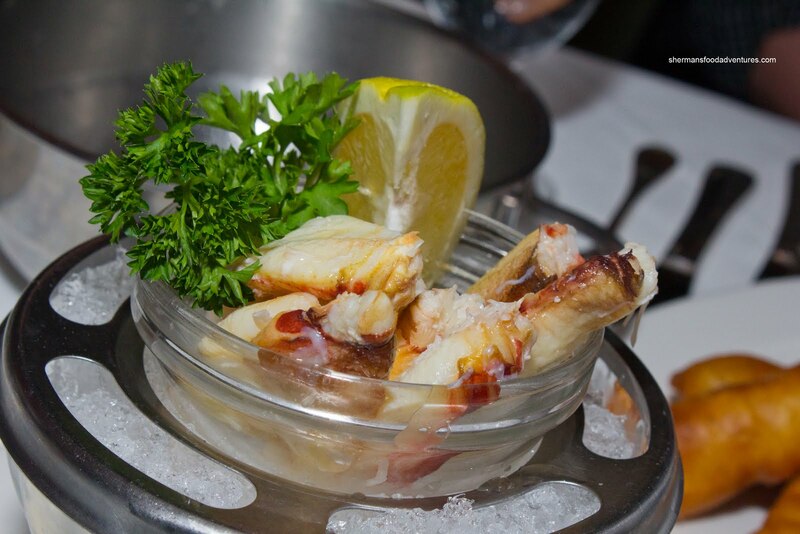 Although the Dungeness Crab Leg Cocktail drew some mixed reviews, there was no denying the quality of the meat. It had pillowy soft texture with the requisite fresh bounce. Naturally sweet and savoury, the leg meat was a real treat. The mixed response was essentially due to the dijon mayo dip which was considered bland. I didn't mind it since a more powerful dip would've overwhelmed the crab meat. As for our last appetizer, we all agreed it was the weakest. The Vanilla -Battered Prawns, in theory, sounded like a can't miss dish. In reality, the batter was too thick. 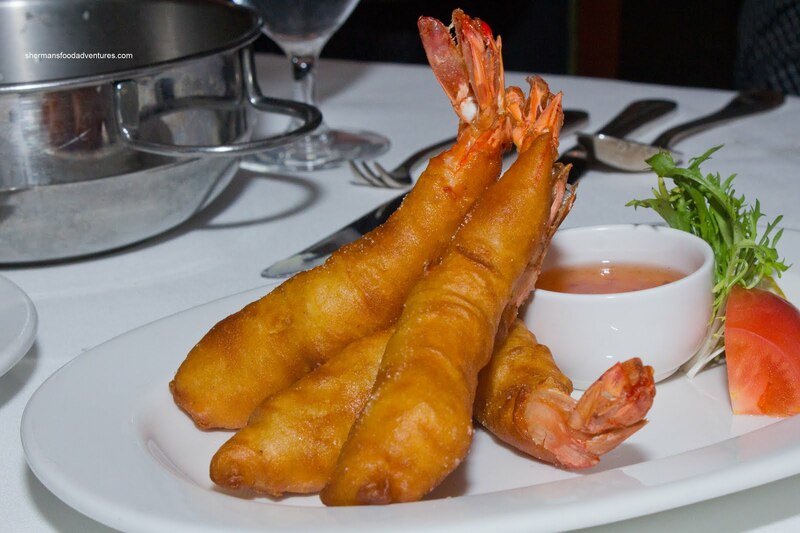 Although the prawns were fantastic, the batter was too prominent. We did love the dip though. It may have looked like the run-of-the-mill sweet chili sauce, however, it really delivered a lingering kick. When it came down to ordering our mains, we were having a difficult time deciding. Actually, I was trying to stay way from a steak since I would already be having it the next day. Then Costanza suggested we all share 4 entrees instead. He totally read my mind! LOL... So this way, I could still order steak and eat it too since I would only be obligated to 2 pieces. We ended up deciding on the Bone-In Rib Steak which was grilled to a perfect medium-rare. 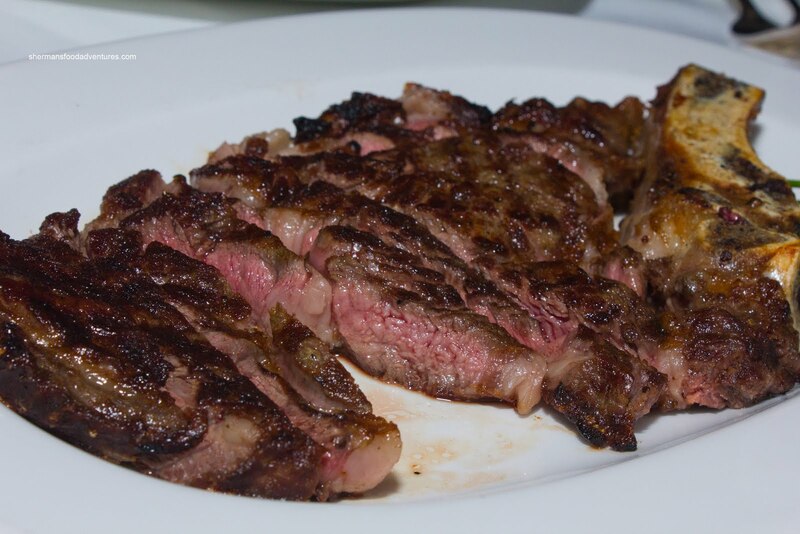 It was well-marbled (Canadian Prime) and charred for a full-bodied flavour. The meat was super-moist and didn't require much effort to eat. It was a touch salty though. This was an expensive, yet well-worth it steak. 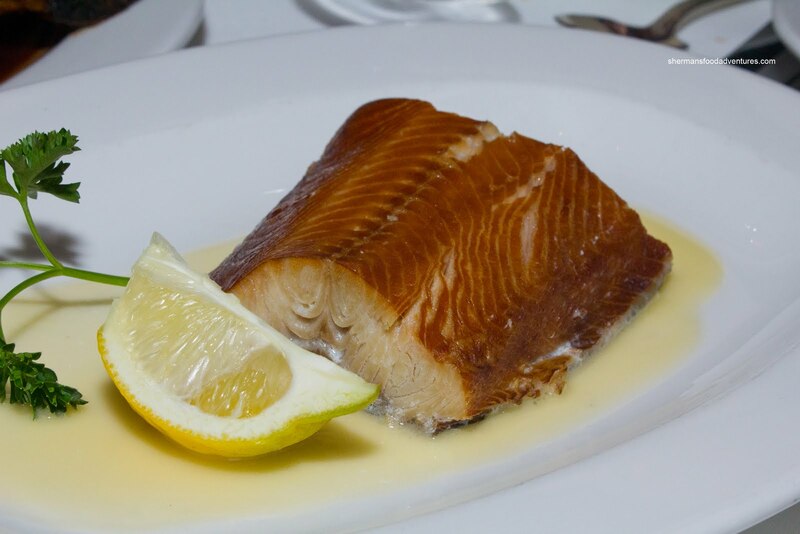 Snake wanted to go for a fish dish and ended up choosing the Smoked Alaskan Black Cod. It was poached in milk and presented with a lemon beurre blanc sauce. As explained by our server, the restaurant receives the cod smoked whole and then they cut it up piece-by-piece. Hence, the smoke flavour was really intense and penetrated deep into the flesh. There was no absence of flavour which really made the buerre blanc more of a bystander than anything else. Although the fish was moist and flaky, we would've liked to see it a bit more "black cod-like", if that makes any sense. 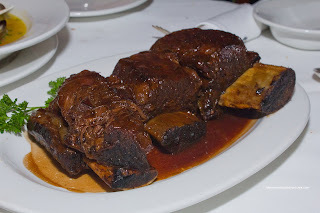 Even before we got a chance to open our menus, Costanza called dibs on the Braised Short Ribs. This 16oz behemoth took up the entire plate and would prove to be our undoing. Believe it or not, we could not finish all of our food, not even by a long shot. The ribs in general were okay, but not as good as they looked. There was a rich meat flavour, yet we could've used more seasoning. Furthermore, the meat was a little stringy for a large untrimmed portion of short rib. 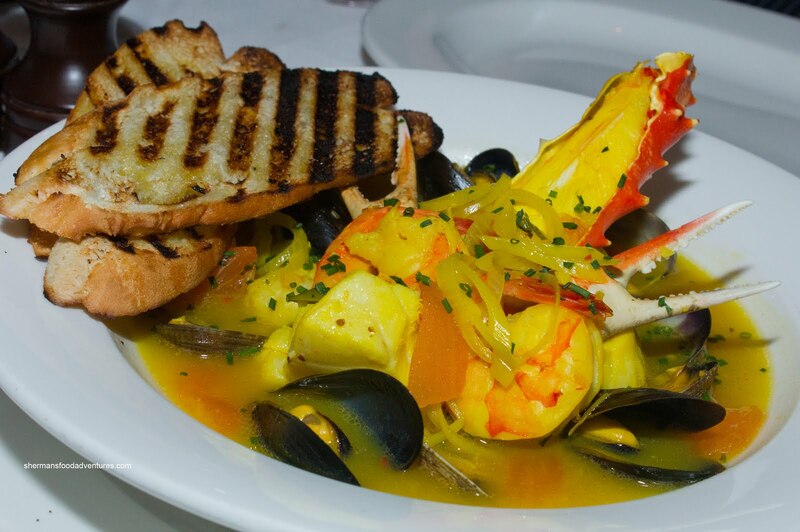 Our last entree was the Bouillabaisse with prawns, mussels, clams, snow crab leg and fish (in this case, it was sea bass). The tint from the saffron both coloured the seafood and flavoured the broth. It was fragrant and seasoned just right. All the seafood was perfect - from the fluffy crabmeat to the flaky fish. For our sides, we went for 3 items including the French Fries. 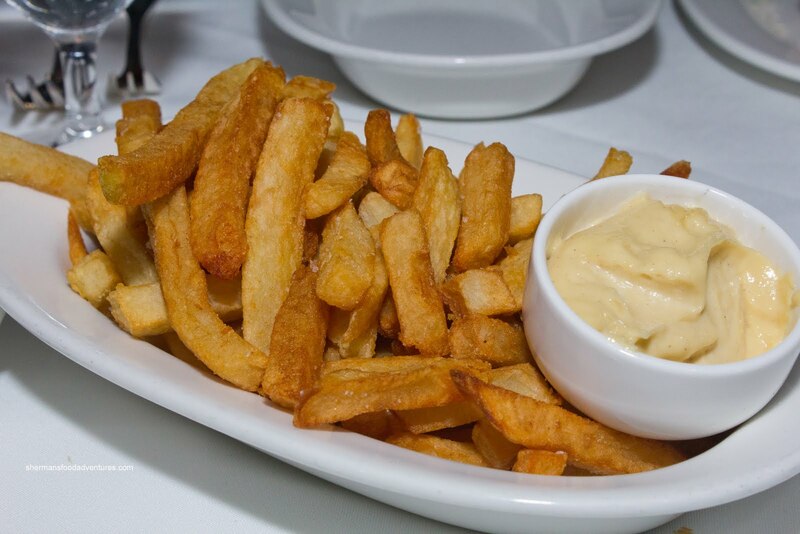 These appeared to be fresh cut and double-fried which gave them a very French-bistro like appearance and texture. For me, I was a bit surprised to see this type served here. A definite pleasant surprise though. They were crisp and for me at least, appropriately served with a side of mayo. 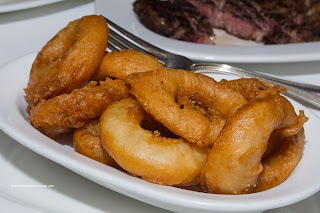 Our second side was the Tempura Battered Onion Rings. Resembling the battered prawns we had as an appetizer, the tempura was thickly applied to the onions. We would've liked to see just a touch less batter because it was not really all that appealing in the middle despite the crisp exterior. With all that being said, we didn't dislike them either. 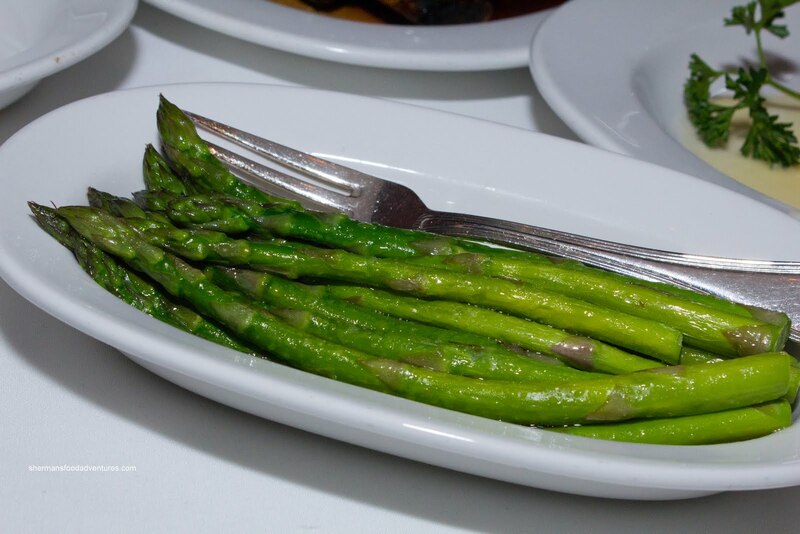 Lastly, to get our fill of veggies, we got a side of Fresh Asparagus. Not sure if this qualified as our recommended intake since everything else could not be considered health food. Not much to say about the asparagus other than it was cooked perfectly with a nice colour and maintaining a crunch. Not that we really bothered by it, but it was salted aggressively. After it was all said and done, we had spent a pretty penny. A good time was had by all and we're not sure if it had anything to do with the 2 bottles of wine either. Although there were some highlights, some of the food was salty. Sure, it wasn't cheap, yet we got more than enough food and really enjoyed the ambiance. Forever young Sherman, that's what you are. The vanilla prawns used to be really good! They used to look different too with a thinner batter! Too bad they aren't as good anymore. They used to be my favourite. Too bad the ribs were't good either because they look amazing and I would have ordered it.